Costa Crociere is by far the largest cruise operator in Europe and lies within the top ten lines in the world as far as the number of vessels and berths is concerned. The Genoa-based company has also a strong leading position in the South America market, where actually Costa has been a pioneer of this business, his name being always associated with the concept of cruise vacation itself. In 1998 Costa celebrated 50 years in the passenger industry, with a background embracing the glorious days of the transatlantic crossings. In this half century activity, what has not changed is the reputation for high-standard services that Costa has been able to achieve throughout the world. Their cruise product is largely based on the most credited Italian style. However, as Costa's market is worldwide, all different national tastes are taken in account. At the end the holidays onboard Costa vessels meet perfectly the wishes and requirements of a multi-national clientele. The best index of this leaderhsip is the excellent occupancy rate, which is in the region of 100%. 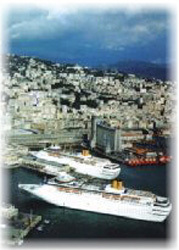 Costa Crociere operate six ships directly: Costa Victoria (built 1996, 1,900 pax), Costa Classica (1991, 1,300), Costa Romantica (1993, 1,300), Costa Allegra (1969, 800), Costa Marina (1969, 800) and Costa Riviera (1963, 1,000) for a total over 7,000-berth capacity. Also the line controls leading French company Paquet Cruises, owning and operating the smaller Mermoz (1957, 500). In the future Costa will adjust its offer to the tremendous growing trend experienced by the cruise industry. A new order has already been placed with Kvaerner Masa Yard, who in 2000 will deliver the Costa Atlantica. The 82,000 gt ship, capable of 2,100 passengers, is to be built at a cost of approximately USD 380 million. Costa's next flagship will boost capacity to approach 10,000 berths confirming the firm confidence that the owners have in the future of the Italian company. 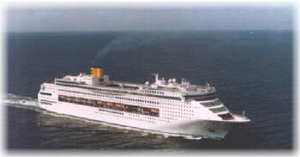 During 1997 Costa carried in excess of 362,000 passenger and reported almost 2.9 mill berth-days. This is quite an improvement since 1993, when the correspondent figures were respectively 224,000 and 1.8 mill. Costa's itineraries cover the Caribbean, the Mediterranean, Northern Europe, South America and the Transatlantic offering about 190 sailings per year to call some hundred ports in forty countries. 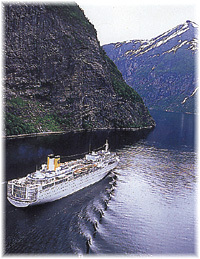 Although Europe (both the Mediterranean and North Europe) and South America are the areas where Costa emerges more substantially in respect with the competitors, covering respectively 25% and 20% of the relevant markets, the line maintains a strong presence in the American market too, deploying seasonally two ships in the Caribbean with a wide number of cruise itineraries. In fact, Costa's source market feature Italy, as easily predictable, at top position with 40%; but USA ranks third with 17%, being just slightly lower than France (18%). Costa's Europe passenger mix is made approximately of 80 percent Europeans and 20 percent North Americans while in the Caribbean, where ships are home ported at Fort Lauderdale (Florida), Costa carries approximately 80 percent North American passengers with the balance from Europe. In this view, an evident advantages of the link with Airtours, which owns Costa at 50%, is the opportunity to boost the "exchange" of American tourists in Europe and viceversa offered by such a great air operator. Carnival Corporation and Airtours completed the acquisition of Costa Crociere one year ago; immediately the new shareholders (50% each one) laid down a development strategy which pivots on the realization of the new flagship. The latter will be followed by another two, for delivery scehduled by 2002 and 2004 respectively. It is still undetermined whether they are bound to be simply a replica of the 82,000 gt Costa Atlantica or if Costa is to make the big leap to the over 100,000 gt size. The top management was reshaped after the late '97 take over by Carnival and Airtours. The Costas sold all their interests and therefore no member of the Genoa-originated family recovers anymore top positions. The new proprietors appointed a trust-worthy manager at the helm; Managing Director and Chief Executive Officer Pier Luigi Foschi is a brand new name for the cruise business, as he comes from the elevators industry. Indeed Micky Arison and his partners opted to trust a very experienced international manager, although coming from a totally different field, rather than appointing somebody with experiences in other cruise lines. This choice underlines tha fact that Foschi is charged with the daily running of the company while the most important strategic decisions, such as the order for newbuildings etc., are still a task of the shareholders' executives. As a matter of fact, Foschi himself is convinced that first priority of whichever managing director is to improve the company's efficiency in operations, irrespective of the fact that you are in the cruise industry or not. "The business you are in is not so relevant at the end. Whatever product or service you sell, the fundamental functions are the same: marketing, financing, personnel etc. must all meet the efficiency requirements of the demanding market" he points out. Parallelly to the appointment of Foschi, a new structure was given also to the top management, which now lists Roberto Martinoli (technical), Franco Pellicari (marketing) and Alfredo Rossi (finance) as senior vice-presidents. "The new structure, definitively innovative if compared with the past strictly hierarchical pattern, aims at horizontal integration between the top and the various departments", explains Foschi. The multi-national cruise product that Costa offers has obviously a slightly higher cost than a standardised one fitted to a sole country. This does not represent any drawback, as the return is represented by the immediateness in entering all markets in the world. On the other side, the focus is on the improvement of the efficiency of the inner organization. "This is one field where better results can be always achivede" confirms Foschi. This goal is pursued through the up-grading of the personnel training both as far as the on-board services and the ashore departments are concerned. Foschi's explicit aim is to enhance in the medium term the rate between net income and revenues from the current 6% to 20%. The first consolidated balance sheet after the Carnival-Airtours take-over showed the positive turn impressed by the new management. In the first three quarters of 1998, the Group profit after taxation reported a 76.7% increase (from ITL 84.2 to 148.8 bill) while the turnover marked a growth by +1.6% (from ITL 821.6 to 834.3 bill). Parent company Costa Crociere Spa posted a profit after taxation of ITL 36,6 bill and turnover of ITL 813.4 bill. Foschi attributes the improvement of the results to three main factors: increase of the average sale price, reduction of some operational and financial costs and increase of the occupancy rate. "The 1998 performances are very encouraging and represent the best pathway to achieve the market goals that we have targeted for the future" Foschi outlined. Costa traffic volumes marked a very slight reduction: 278,324 passengers were transported in the first nine months of 1998 (versus 280,426 in the corresponding period of 1997) while bed-days were 2,157,604 (versus 2,178,862). In view of its strategic plan to concentrate all activities directly connected with the cruise business, Costa is now in the process of incorporating Zerbone Catering Srl into Costa Crociere Spa. Finally the Board of Directors at the mid-December 1998 meeting entrusted Efibanca to issue a loan to raise ITL 400 bill in order to finance a large part of the construction of the Costa Atlantica.